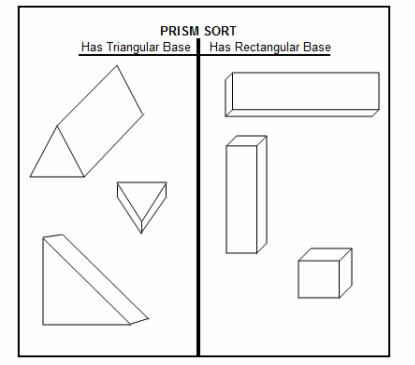 In these lessons, we will learn what is a prism. We will learn about rectangular prisms and triangular prisms. We aill alos learn the nets of prisms. A prism is a 3-dimensional figure. All prisms have faces, two of which are referred to as bases. These two bases are parallel and may take the shape of any polygon. The name of a prism refers to the shape of the bases, for example, triangular prism, rectangular prism, hexagonal prisms. In Grade Four, exploration is focused on rectangular prisms and triangular prisms only. 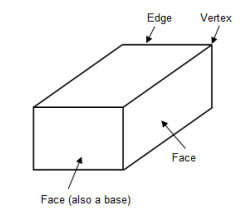 A rectangular prism has 6 faces, 12 edges and 8 vertices. Note that all square prisms (or cubes) can be called rectangular prisms because a square is a rectangle. A triangular prism has 5 faces, 9 edges and 6 vertices. Prisms are three dimensional figures solids that occupy space. They come in many shapes and sizes and are named by the shape of their base. How to find edges and vertices. Spheres, triangular pyramids, square based pyramids, and an explanation of edges, vertices and faces. 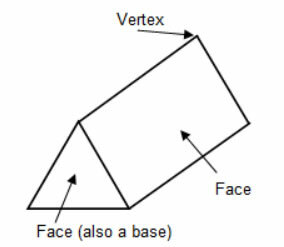 A vertex is a corner. Plural for vertex is vertices. An edge is a straight line. A face is a surface. A net is a 2-dimensional pattern of a 3-dimensional figure that can be folded to form the figure. The following diagrams show the possible nets for a cube and also nets that cannot form a cube. How to represent 3-dimensional figures with nets by analyzing their faces and bases. What is the net of a shape? A few example nets together with their 3D counterparts. This video will show how a net is folded to form a cube. This video will show how a net is folded to form a triangular prism.